It looks like you're off to a great start, nice going. 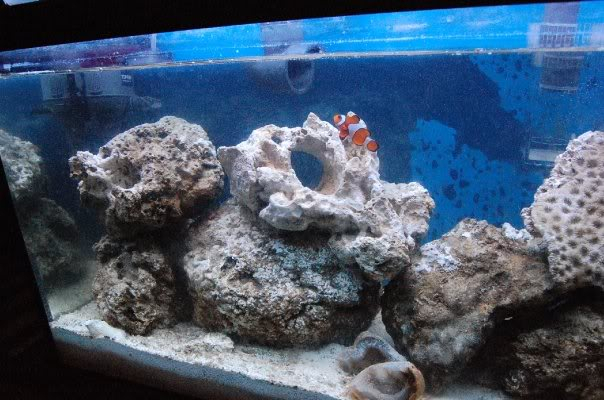 If I were you I would wait off on adding an anemone until you're tank has a lot more time to mature. You're tank is to young for an addition like that. 2Frosty4u wrote: It looks like you're off to a great start, nice going. If I were you I would wait off on adding an anemone until you're tank has a lot more time to mature. You're tank is to young for an addition like that. Pics are looking great though! I'll 2nd the advice on the anemone. A mature and stable tank is best for this addition (6 month+). You may also want to consider beefing up your lighting for the anemone. I will take your advice and scratch the anemone, however, i figured a 18k T5, and a actinic T5 would be plenty of light for just about anything. Are the T5s high output or normal output. The 18k refers only to the colour spectrum not the "light" output (lumens). For a rough (and dirty) calculation consider targeting 3 to 4 watts of light per tank gallon to keep anemones happy. This is only a rule of thumb. I do know of others on this site that have achieved success with less lighting.